The good folks of Hastings did it! The 1931 Hastings lifeboat and Dunkirk little ship Cyril and Lilian Bishop has been made beautiful as could be, and now stands outside the town’s All Saints Church. 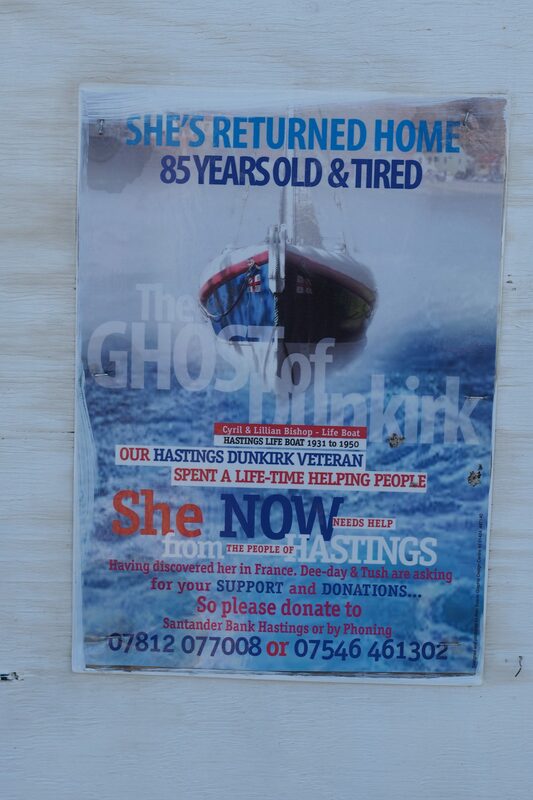 If like me you were intrigued by this poster included in my post of photos from Hastings beach the other day, the story is explained in this Vimeo video. The Cyril and Lilian Bishop is a lifeboat that saved 34 lives while operating at in Hastings during the 1930s and then spent four days and four nights rescuing British and French soldiers from the beaches during the evacuation of Dunkirk in World War II. She disappeared from history for a while until a phone call from a Belgian resident alerted Hastings folks ‘Dee-Day’ and ‘Tush’ that she still existed and was in a French boatyard – so they made plans to bring her back to Hastings. The lifeboat was named after the philanthropist who paid for her to be built, and her husband. Fitted with a 35hp petrol engine, the new boat was Hastings’ first lifeboat to have a motor and radio communications. However, there was no tractor, and so a lot of helpers and sometimes horses were used to get her up and down the beach. The Cyril and Lilian Bishop is said to be best known by the nickname ‘The Ghost of Dunkirk‘, which she earned during the Dunkirk evacuation in late May 1940, when she was one of the shallow draught vessels used to get troops off the beach and out to the waiting ships. It was said that to the soldiers queueing to leave that she appeared like a ghost amongst the smoke and mist during the evacuations. After doing her duty at Dunkirk the boat was hosed out to remove sand. A hole was found in her bow, and there were two bullet holes. Sand was found in her fore locker, and her mast head light was also full of sand. Cyril and Lilian Bishop continued in her RNLI service at Hastings until 1950 when a new lifeboat arrived. Dee-Day and Tush plan to restore her and put her on display in Hastings Old Town. Follow her progress on the Facebook page Cyril Lilian Bishop and Twitter @cyril_lilian1.